At some point in your life, you will experience the “Dark Night of the Soul” where it seems that everything that can possibly go wrong, will go wrong. What many people fail to realize is that this is a true blessing. The “Dark Night of the Soul” occurs when your life appears to hit rock bottom. You may experience a plethora of “bad breaks” in your personal life, financially, mentally and/or physically. At first, you may feel hatred towards those who contributed to your “Dark Night of the Soul” You might question the Creator and feel as though your spirit guides and guardian angels have failed you. This couldn’t be further from the truth. In time, you will end up surrendering yourself and your ego to whatever the Universe has in store for you as if it is all now in the Creator’s hands. This is where the cleansing begins. Before you incarnated here, you made a soul contract that involved everyone who led you to your “Dark Night of the Soul”. When you were on the other side of the veil, you specifically chose these people to help you grow spiritually. Some of these people may have also had previous karmic relationships with you in which you both needed to try to resolve in this incarnation. Your spirit guides and guardian angels are with you every second of your life. When you feel pain and sorrow, they do too. As much as they want to see you happy, they also realize that you need to experience certain life situations in order to grow spiritually. Every day, you are being guided in the right direction towards fulfilling your life’s purpose and that guidance includes experiencing the “Dark Night of the Soul”. Letting go of our images of God can be terrifying. It is often the result of an experience of suffering in our lives, when our previous understanding is no longer adequate to give meaning to what has happened to us. When my mother died suddenly in my early thirties, I was thrust into the desert. All of my certainties about God and life were stripped away and I was left raw and frightened. Many people offered trite words and shallow comfort in my grief, they were not willing to sit with me in the darkness, but only hoped to rush me through to a place of light. This is the mystical experience of the “dark night of the soul”, when old convictions and conformities dissolve into nothingness and we are called to stand naked to the terror of the unknown. We must let the process move through us one which is much greater than we can comprehend. We can never force our way back to the light. It is only in this place of absolute surrender that the new possibility can emerge. We don’t just have one dark night in our lives, but again and again, as we are called to continue releasing the images we cling to so tightly. 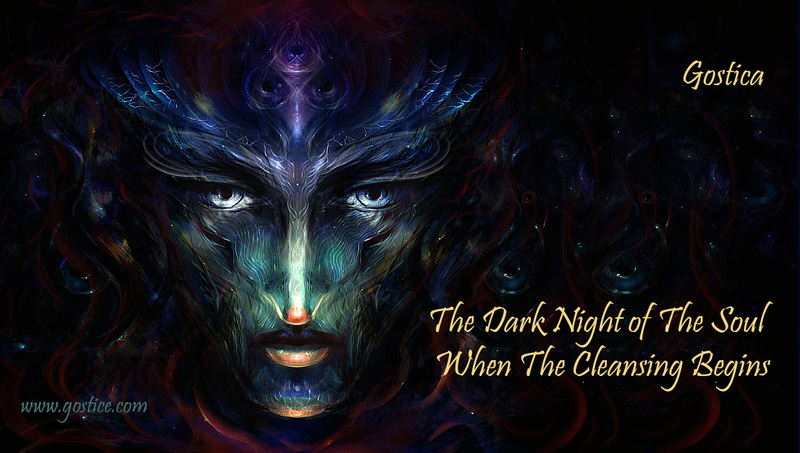 The true blessing of the “Dark Night of the Soul” is the spiritual cleansing that you receive. When you have reached the “Dark Night of the Soul”, you have reached your lowest point in this incarnation. To that I say, “Congratulations!” From this day forward, your life will take on a new meaning as you begin to understand why everything HAD to happen the way it did. Once you come out on the other side of the “Dark Night of the Soul” you will gain a new perspective and appreciation of what you had to go through and these experiences will exponentially magnify your spiritual progression. Typically, many people will experience the loss of ego for the first time in their life during the “Dark Night of the Soul”. This can be a very humbling experience. We typically associate a title or our accomplishments with who we are but fail to see that ultimately, we are spiritual beings having a human experience. 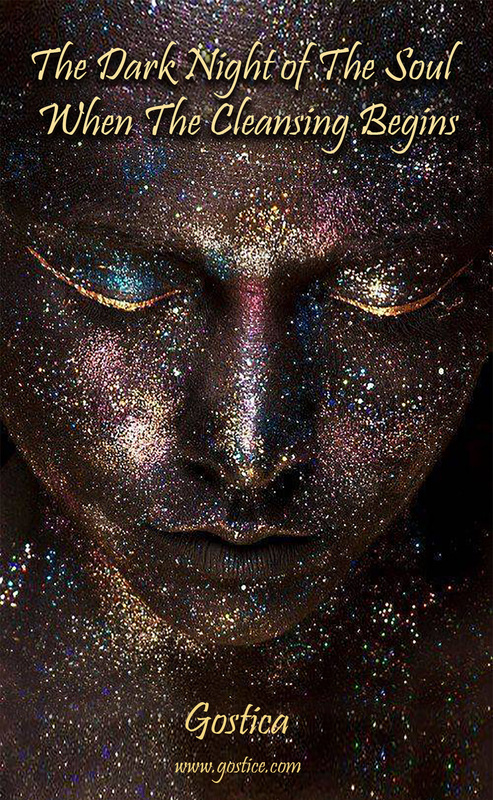 When we lose our ego, we can finally connect to our spiritual essence because we are no longer associating ourselves with society’s preconception (or our own preconception) of who we are. The “Dark Night of the Soul” gives us a new sense of appreciation for all that is good in life and shows us how little we truly need to be happy. But the most important aspect gained through the “Dark Night of the Soul” is the connectedness we receive through our transformation of consciousness. It’s as if you are given a new lease on life. You stop blaming other people and begin to look within for answers. You learn forgiveness and gratitude. You realize that you needed to have these experiences in order to get you pointed in a new direction that will facilitate your spiritual growth and life purpose. If you are currently experiencing the “Dark Night of the Soul,” I can assure you that there are much happier and fulfilling days ahead of you. At some point, you should put your faith in the Creator’s hands and know that you are always being divinely guided toward your life purpose. Look at where your life has taken you and what direction you are being shown to go. Try to forgive those who have led you to your “Dark Night of the Soul” as well as forgiving yourself. Don’t try to force any immediate changes because they will come to you when you are ready. Sometimes during the dark night of the soul, the best thing to do is nothing and just live in the now. While it may not seem like it right now, the people who led you to this point are most likely part of your soul group. On the other side of the veil, they loved you so much that they volunteered to lead you into the “Dark Night of the Soul” if you ever got to the point of where you were veering from your life’s purpose even if it meant that they would no longer be part of your life during this incarnation. The best way to look at the dark night of the soul is to compare it to a butterfly. Before your dark night, you were a slow moving caterpillar who was limited to a small area because of your lack of mobility. You didn’t realize how much more you were capable of doing until you spun your cocoon. Once you emerged from your cocoon, you transformed yourself into a beautiful butterfly whose boundaries were limitless! In this analogy, the cocoon is where you do nothing except going within. You are on the verge of a spiritual transformation, so let go of your ego, surrender to the Universe and soon you’ll be spreading your wings in flight! Check out Thomas Moores’ “Dark Nights of The Soul”. A wonderful, in depth explanation of this process.